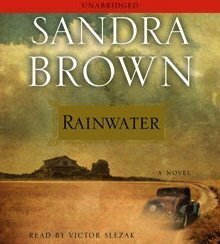 As a librarian, I "knew" about Rainwater by Sandra Brown months ago. I've never been a Sandra Brown reader (one of those authors I've just never gotten around to), and this book stuck in my mind mostly because it's a historical set during the Depression. Didn't mean I had any plans to read it though. That is until I read Rosie's musings on the book. That was enough to peak my interest, and knowing that I'm massively behind on my reading, I put myself on the wait list for an audio book copy at work. The year is 1934 and Ella Barron runs a boarding house in Gilead, Texas. Her husband is not in the picture, and she has a 10-year-old son, Solly, who is autistic. Given the economic climate, she's making a passable living for herself and Solly, although her days are filled with hard work and her personal life is non-existent. That is until the local doctor shows up on her doorstep with David Rainwater. Mr. Rainwater needs a place to live and Ella has an empty room. After some haggling, Ella decides to rent him the room, only to find that his arrival on her doorstep is the first of many changes in her life and in town. Unrelenting heat and drought have caused the local farmers and ranchers to make heartbreaking decisions in order to ensure the survival of their families. There is a local shantytown filled with desperate men and families who have nowhere else to go, that has caused much sneering among the more well-off townsfolk. Plus, being 1934 Texas, local race relations are....well, what they are. Into this mix is the villain, Conrad Ellis, a vile, hateful bully who arrives on the scene to stir up a mess of trouble. This is not a romance novel (as we currently define the genre), and while having never read Brown, I still know enough to realize this book is a departure for her. How willing the reader is to roll with this will determine how well they like the book. Frankly, by the end of the first chapter the author has set the tone, and anyone who is left with the hope that they're going to get a Care Bear Rainbow Ending? Yeah, good luck with that. I'm a reader who hates to feel manipulated, and I've read books of this ilk in the past where stuff comes flying in out of nowhere, like the author was told by someone they had to make the ending depressing at the last minute. I didn't get that feeling with Rainwater. For one thing, Brown pretty much lays her cards out on the table with the first few chapters. As the reader I knew how it was going to end (to a certain extent), it was just a question of the journey the author was going to take to get there. I suspect many readers will have issues with this "depressing" tone - and while the setting, time period and aspects of the story are heartbreaking, I never felt like Brown was burying me in sadness. This is probably because the character of Ella worked so well for me. Her thoughts, her actions, her undying devotion to a son she so desperately loves but cannot reach, and her feelings for Mr. Rainwater. Frankly the tension between the two main characters is some of the best I've encountered in my recent reading, putting more than a few romance novels I've read this past year to shame. As I mentioned, I listened to this on audio, and it's hard to say if I would have had the same reaction to this story had I read it. It is a slower story, that simmers through the first half and hits full boil towards the finish line. But I found it to be just about perfect, aided by the excellent narration of actor Victor Slezak. I was riveted to this audio book from the first CD and had to resist taking it out of my car this weekend to finish it up in the privacy of my home office. I suspect that Rainwater is the kind of book that will divide readers. Rosie hasn't graded it yet because she needed time to think on it, and Keishon, while giving it a B, didn't write the most enthusiastic review for it. But for me? It totally and completely worked. Everything about it. From the audio production, to the narrator, to the story, the bittersweet heartache, just everything. Wow. I've been looking forward to this one! Love the era and the author. Looks good! Thanks for the review. I have always thought I could only handle a Carebear Rainbow ending, since I love happy endings (and life is sad enough as it is, no? ), but the more I read lately I'm realizing I can totally do a sad or bittersweet ending...IF the author makes it work. Sounds like an excellent read. Jill: I really thought the author did a wonderful job with the time period and setting. Lyndee: I do think she handled it well. I dislike tragedy for tragedy-sake, and I really dislike it when an author doesn't lay the groundwork and throws in the tragedy for shock value. I find that manipulative, and it annoys. But Brown DOES lay her ground work, which is why I suspect the bittersweet aspects of the story worked for me. Kati: Hey, it happens - just not all that often :) Like I said, I didn't "read" this - so I can't say if my reaction to the story would have been the same or not. But if you like audio books, or are curious to try one? Yeah, this one was very, very good. thanks for making the distinction between "literary fiction" that manipulates you and twists things for a reaction as opposed to a more organic story. that is why i have such a huge beef with so many lit fic and "oprah's book club" type books, they try way too hard to be depressing and twisted to make a point and to manipulate you on purpose, but when it makes sense in context it is much easier to swallow a non carebear ending. hi Wendy, I read Rainwater last week expecting the old Sandra Brown storyline. I was pleasantly surprised that it wasn't. Even though I felt the ending was a bit rushed, I found myself crying and very emotional. Excellent book! If I were giving out grades, I'd give it an A, too! It has been so long since I read a Brown novel, more of a fan of her categories. So not a romance? Sounds like a perfect story you would watch on the Hallmark channel, unless the ending is too sad. Wow, sounds really interesting. And, an A? So is the slump well and truly over? Unfortunately, neither the municipal or county library have the audiobook. However, I'll have to wishlist it at Audible. Wow! sounds good, and you gave it an A. I've added it to my "check out list". Thanks Wendy! Wow Wendy. An A? You own it, girl. Work it. Work it. I can't say I would read it. I would have to be in the right frame of mind for this kind of story. Lusty: I don't like surprises - so when the tragedy is heaped on after coming out of left field? I get annoyed. But here, the author really makes it work because it's a slow, gradual build. Renee: The slump has been drifting in and out. I'm either tearing through books or slogging through them. There's no in between. Bugger on the libraries not having a copy. It's SANDRA FRACKIN' BROWN! Sadly I borrowed "my" copy from work or else I'd be happy to loan it to you. Leya: I think you'd really like this one. Totally off topic, but every time I see that title the Madonna song pops into my head. THANKYOUFORTHEEARWORM! I added this book to my wishlist a couple weeks ago and I'm still debating about it. I have personal issues with SB, so I'm not sure this would work for me. I love listening to Victor Slezak read. His reading of Sandra Brown's "Envy" is a real treat. I can hardly wait to listen to this book. Holly: Ha! I actually came up with the title of this post after the fact. It sat blank for a while until I though maybe I should pick a song with "Rain" in the lyrics. Madonna won. JayBeeBee: He was really fantastic! I'd never heard him narrate before, and it was a wonderful discovery. Oh Wendy, my Wendy, you always put my reviews to shame. Should one give a book an "A" because they can't stop thinking about it, a book that resonates on some deep level because even though you do feel slightly manipulated you "felt" the book? I'm so torn! Rosie: I honestly have a devil of a time writing reviews for books that I loved. It's a quirk. The Can't Stop Thinking About It factor usually signifies "keeper" for me. I'll read books, enjoy them, but then I'm moving on to the next one the moment I hit "The End." If I find myself returning to the story, or thinking about it days after? Yeah, it "stuck." Not all stories "stick" - and the ones that do are special IMHO. I was less than impressed and I admit to being a Sandra Brown fangirl. Excellent review. I don't know what the hell I wrote. But you should def. check out more Sandra Brown stuff. Keishon: Your review left me with that impression. I'll probably pick up more of her stuff on audio - skipping the early romance years. Dredging my memory, I think I listened to one of her early romances (Fanta C? Maybe?) on audio - and it really didn't do a lot for me. So I'll probably stick with the suspensey stuff. I think this is an A book too, and I normally don't like Sandra Brown's work. If she keeps writing like this, I could become a fan. Rebecca: It really worked for me. I can understand why it won't work for some readers, but it hit me just the right way, and I listened to this on audio at just the right time. Sometimes timing is everything.